"I have come to bring fire on the earth, and how I wish it were already kindled! But I have a baptism to undergo, and how distressed I am until it is completed! Do you think I came to bring peace on earth? No, I tell you, but division. From now on there will be five in one family divided against each other, three against two and two against three. 53They will be divided, father against son and son against father, mother against daughter and daughter against mother, mother-in-law against daughter-in-law and daughter-in-law against mother-in-law." I have a question… Can anybody tell me what did we celebrated this pass Tuesday? 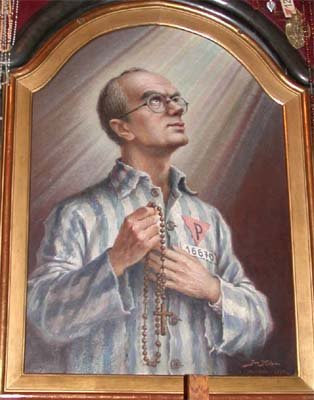 I’m sorry that was a trick question just to make sure you are with me…This past Tuesday we celebrated 66 years, since the death of St Maximilian Kolbe, in the concentration camps. You might know his story but it is worth repeating. In July 1941, a man from Kolbe's barrack vanished, prompting the camp commander, to pick 10 men from the same barrack to be starved to death, a common way of punishment. One of the selected men, Franciszek Gajowniczek, cried out, lamenting that he will never see his family again. Maximilian took a step forward identified himself as a Catholic priest and volunteered to take the place of this family man. During the time in the cell, he led his companions in songs and prayer. After three weeks of dehydration and starvation, only Kolbe was still alive. Exasperated the guards finally executed with an injection of carbolic acid. I bring this up today because St Maximilian is a good example of what Jesus meant when he said that he had come to set the world on fire. This final act of self sacrifice, giving his life so that other could live, was the culmination of a life dedicated to following the gospel. Those who have never heard this gospel might think, because of the horrendous way St Maximilian died, that this teaching must be a very dangerous, teaching. But we who have been brought up listening to this gospel know how simple this message is: Love God with all of your hard and mind love your neighbor like yourselves and love and pray for your enemies. You might think that the Gospel calls for the overthrow of governments and the destruction of civilization by the way those who decide to follow it are treated. Even today Christians are persecuted and martyred, just because they live the gospel. And yet in today’s Gospel Jesus makes a point to tell us that this message, as simple and as peaceful as might sound. This message, will set the world afire. It will shake society to its core. This message when lived like he demands us to live it has the potential to shatter the most basic structure of our society, the family. It seems incredible that a simple message of love and peace will, turn fathers against their own sons and daughters against their own mothers. How could this be? How does forgiving your enemies and loving your neighbors can be a cause for division? My brothers and sisters we like to think that it is easy to live this simple message. We are conditioned to think of the Jesus words as, what I like to call The Gospel According to Barney, “ I love you, you love me, we are a happy family!” but the reality is that to truly follow his commands, like Jesus expects us, we must be willing to take on very unpopular stands, to risk our relationships and even our lives for sake of these words. We must be willing not only to stand for the unborn, but to be agents of healing, mercy and compassion to the women that have had abortions, and to those that have facilitated this procedure, the doctors, the nurses and the politicians. We must not be satisfied with coming to church every Sunday but we must take the presence of Christ to those who are not here, to the poor and the lonely. We must be willing to share and alleviate the pain of the immigrant that only wants a better life for his children, regardless of what our political incline is. To be a follower of Jesus means to take on the very essence of our culture. The good news is that we are not alone in this struggle. Like the second reading says, there is cloud of witnesses that surrounding us. These are the witnesses that willingly heard the message of Jesus and embraced it. These are the ones whose examples we should follow. These were the ones that set the world on fire. Their names are known to us Francis, Mother Teresa, Maximilian Kolbe, John Paul the Great. But we not only have the example of their lives, Jesus gives himself to us in every mass so we do not have to struggle alone. In the Eucharist we receive the strength we need to live this message everyday. But we must be willing to set the world on fire too, to stand against our culture, and to never compromise for the sake of a false sense of harmony and peace. Only then we will be able to say like Jesus, like the saints and the martyrs, we to have set world on fire.